I didn’t set out to buy this book specifically, I normally have an idea of what I want when I’m in a bookstore. However, on this occasion I was doing that weird fast walk, but not quite run you do when you’re on the way to catch a flight and pushing the time. Luckily there was a newsstand right next to the gate and I’d walked quickly enough to buy myself some time to browse. 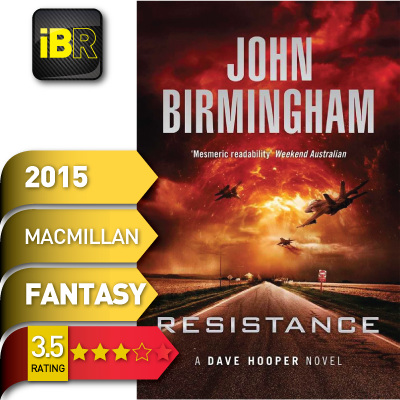 So, with the few minutes in hand I saw Resistance by John Birmingham, I know his work having previously read his great epic future history series the Axis of Time trilogy, so with my row being called I bought it. Bugger! In my rush I didn’t realise this was the second book of the series, the first being Emergence. I really, really like to read my series through from the first book, so I was prepared to be confused and annoyed at starting half way through the story. Surprisingly though I wasn’t really lost at all, the first book’s plot is alluded to enough early on, without being a boring data dump, to make this second book make sense pretty quickly… well as much sense as Demons invading the world can make anyway. We follow the tale of Dave Hooper, an oil rig worker who really isn’t the nicest person, a messy divorce and a delinquent fatherhood attest to this. That is until he manages to kill a Demon champion, inherit its powers and become of all things humanities Champion against the various underworld hordes trying to take over the world. Dave, or The Dave as he’s named by the Demons, has already carried off some spectacular battle victories prior to the opening of Resistance and is trying very hard to parlay this into fame, fortune and women… and he’s being very successful at this. The public at large have placed him on a very high pedestal indeed and Dave is working it for everything he can get. Ensconced in a Las Vegas Casino with his basest desires being pandered to, he is asked to go back into battle as the Demon Hordes, smarting from losing their initial battles against the humans, re-group and invade in earnest emerging from caves all over the world. This time they’re serious about putting the human “cattle” under their boot for real. The thing is, Dave is not that interested and certainly doesn’t feel like towing the government line… not at least without lining his pockets along the way. So begins the tension between Dave, his minders who want to control him and the ever more desperate needs of humanity to have their Champion re-join the fight against an ancient and uncompromising evil. This was the perfect book for my flight; the story really clipped along with great energy and pace, I think I was on the last chapter by the time I landed and it wasn’t a long flight. Sure this is not a deep book by any means, but there’s quite a bit of character development all the same. Dave, untouchable supernatural Champion that he is, still gets taken down more than a peg or two, by people he hates to admit he cares about. The supporting cast also get a bit of development, but as with all books of this type, it drops off pretty quickly to one dimensional fit for purpose characters. Not that this is a criticism, it’s just how it is. What really drew me in and kept me enthralled was the world that Birmingham has created here, especially the political manoeuvrings in the Demon underworld and their complete shock at what the humans have turned into. We are no longer the cattle they remember and possess the ability to fight back with devastating force, something most Demons simply can process. In fact for me the real stars of the book are not Dave and his entourage, it’s the Demon Overlord and his mind consuming assistant Thresh who ends up consuming one human mind to many. Dave can be grating at times, but Thresh and his boss are the life of the story. Light, fast, funny and interesting, but ending far too soon… I get the feeling that this may have been just half a book, it ends frustratingly on cliff-hanger ready for third instalment. It’s pretty clear there is another book after this one and the fact that it’s not a really a self-contained story takes the gloss off at the end. Yes, I bought the next book Ascendance for my return flight. Recommendation: Great fact paced page turner with quite a bit of whit and gore in equal measure, really intriguing world being built here and perfect for a read on the go.